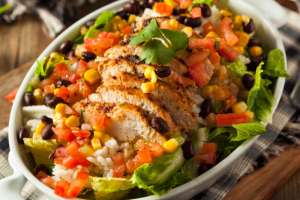 Who doesn’t love a good burrito bowl? They are so versatile because you can make them as simple or as complex as you want. They can be as basic as plain black beans, sliced avocado, store-bought salsa, and rice, or you can add an array of your favorite toppings. Here is a great homemade bowl that is sure to please! It is so TASTY! For the rice: Add the rice and 1 tablespoon of extra virgin olive oil into a medium pot along with 2 cups of water. Increase heat to medium-high and bring to a simmer. Immediately reduce the heat to low-medium, and cover with a lid. Cook the rice until it’s tender and the water is absorbed. For white long-grain rice this will take 13-20 minutes, but please follow the directions on your specific package for best results. Boil corn according to package. Meanwhile, prepare the Spicy Black Beans: In a large wok or skillet, add the oil and heat it over medium heat. Stir in the onion and garlic, along with a pinch of salt, and saute for about 5-6 minutes, until softened. When the rice is ready, reheat the bean mixture, if necessary. Divide the rice between 3-4 bowls. Top each with a couple scoops of the chicken, hot black bean mixture,corn, and a large spoonful of both the salsa and the Avocado-Lime Sauce. Garnish with sliced green onion and optional sliced grape tomatoes. Serve immediately.